A discussion of solidification and its effects can be found in a set of lectures available online. Information on the friction stir welding of these alloys is also available. Aluminium alloys are grouped according to the major alloying elements they contain. The 4XXX group is alloyed with silicon for ease of casting.Silicon is good in metallic alloys used for casting. This is because it increases the fluidity of the melt, reduces the melting temperature, decreases the contraction associated with solidification and is very cheap as a raw material. Silicon also has a low density (2.34 g cm-3), which may be an advantage in reducing the overall weight of the cast component. Silicon has a very low solubility in aluminium; it therefore precipitates as virtually pure silicon, which is hard and hence improves the abrasion resistance. Phase diagram reproduced with permission from Mikael Schalin, Royal Institute of Science and Technology, Stockholm. Aluminium-silicon alloys form a eutectic at 11.7 wt% silicon, the eutectic temperature being 577 oC. 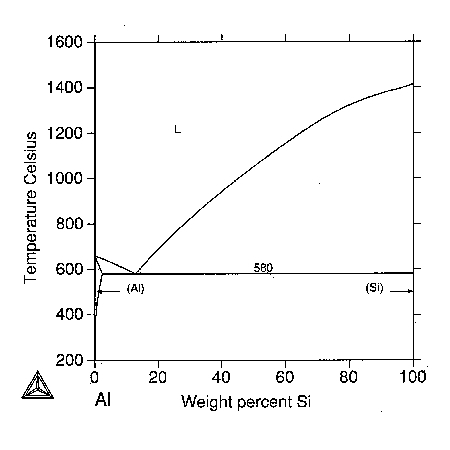 This represents a typical composition for a casting alloy because it has the lowest possible melting temperature. Al-12Si wt% alloys are therefore common. The dark, semi-circular feature is a casting defect (a pore) caused by the shrinkage of liquid during solidification. The microstructure otherwise consists of grey plates of silicon in a white matrix which is rich in aluminium. Although the alloy is slightly hypoeutectoid in composition, there is evidence that solidification started with primary aluminium dendrites (sections of aluminium dendrite arms are visible). This is because the sample did not solidify under equilibrium conditions. Equilibrium solidification would require painfully slow cooling rates, not achievable in industrial practice. Shows the coarse silicon plates in an aluminium matrix. The dark feature is a shrinkage pore, a casting defect. Silicon has a diamond crystal structure and is consequently very brittle. Large plates of silicon are, therefore, detrimental to the mechanical properties. Silicon has a diamond crystal structure and is consequently very brittle. Large plates of silicon are, therefore, detrimental to the mechanical properties. Silicon nucleates on aluminium phosphide particles present in the melt as impurities. The addition of a small amount of sodium to the melt getters the phosphorus, making the nulceation of silicon more difficult. Solidification is therefore suppressed to lower temperatures where the nucleation rate is large. This leads to a remarkable refinement of microstructure. The dark feature is a casting defect (a pore) caused by the shrinkage of liquid during solidification. The microstructure of this sodium modified alloy is much finer than that of the Al-12Si sample. The silicon particles are hardly visible at this magnification. Notice again the primary dendrites of aluminium, attributed to non-equilibrium solidification. Greatly refined particles of silicon as the microstructure is modified with sodium. The copper is used for precipitation hardening (Al2Cu, Al5Mg8Cu26), should that be necessary. Iron is to be avoided if possible, since it can form plate-like precipitates (Al5FeSi) which embrittle the casting and can block the flow of liquid metal in the mould. The strontium, when added delibrately, helps to modify the shape of the silicon, rather as does sodium. Strontium is preferred to silicon, because the effects of sodium fade relatively rapidly when the liquid metal is held at temperature for a prolonged period before solidification. On the other hand, strontium, by a variety of mechanisms, introduces a greater degree of porosity in the final casting [Tynelius and Major, AFS Transactions 101 (1993) 401]. 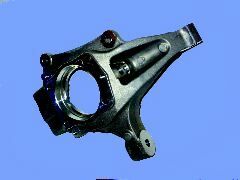 The following images are of cast aluminium automobile components, provided by the Institute of Cast Metals Engineers. Car steering-knuckle made by Hydro Aluminium Fundo. 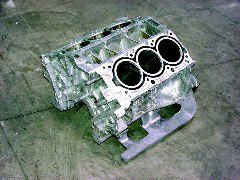 V6 engine-block made from cast aluminium and designed by Hydro Aluminium. A new range of Si/Al alloys containing up to 70 wt% silicon has been developed using spray forming technology. The alloys are 15% lighter than pure aluminium; they have a low, controlled thermal expansion coefficient, a high stifness and high thermal conductivity. They are non-toxic, readily machinable, easily plated with nickel, gold, silver or copper. For more details, see Materials World, May 1999, page 261. Very strong steel (1 GPa) can be shaped by hot-press forming. In this, the steel in sheet form is heated to temperatures in the range 900-950°C for 3-10 min in order to induce it into the austenitic state. 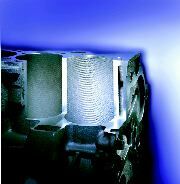 It is then formed using a press with water-cooled dies, which simultaneously shape and quench the component to martensite. The formation of oxide scale during this process is mitigated by applying protective coatings. 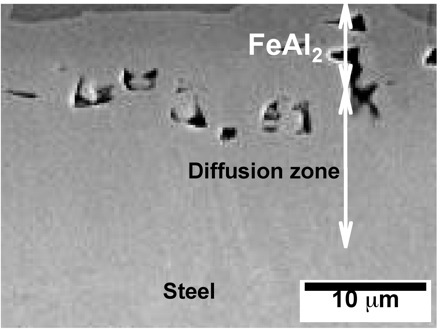 The micrographs below illustrate what happens to an Al-Si alloy coating containing 7-11 wt% silicon (approximately eutectic composition), as a consequence of the heating associated with hot-press forming. 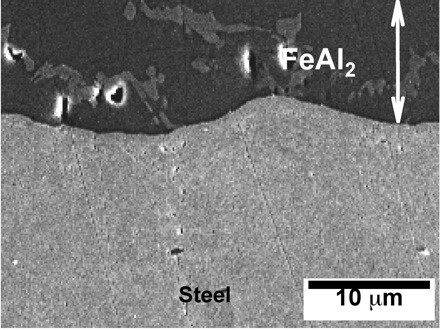 Interdiffusion and reaction between iron, silicon and aluminium leads to the formation Kirkendall voids. The micrographs have kindly been provided by Dr Dong Wei Fan and Professor Bruno De Cooman. Further details are available in a paper entitled Coating Degradation in Hot Press Forming, D. W. Fan, H. S. Kim, J. K. Oh, K. G. Chin and B. C. De Cooman, ISIJ International 50 (2010) 561-568. 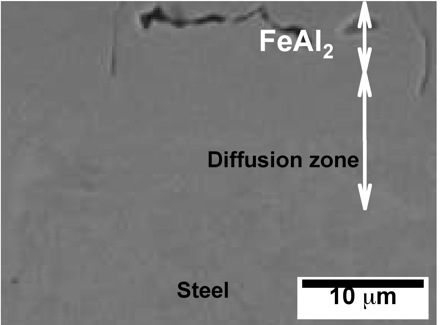 Field emission scanning electron micrographs showing the formation and growth of Kirkendall voids at the coating/steel interface following heat treatment as indicated in the figure captions.